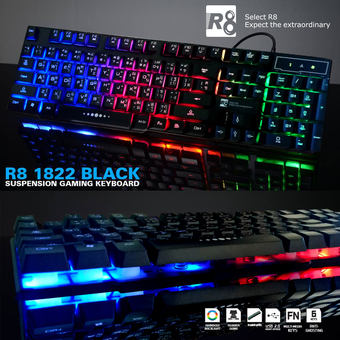 Game author specialized mechanical keyboard Led 7 colors 1822voi R8 design keyboard like one body with contours and very alternative design, LED systems are extremely impressive background with 7 colors displayed simultaneously help users especially the gamers can enjoy at night. The special thing at the table phimR8 1822la keypad buttons are designed higher than the conventional keyboard, the distance from the keyboard up to the buttons is 7mm. Create an empty space below the keyboard buttons help users feel very quiet to type, just like using a real keyboard base. In addition to design high-key as it's easy on the toilet, or when water accidentally parked in nor affected the microchip inside. Helps avoid regrettable damage can occur to the keyboard.